Disney was seeking to make a new animated series that exhibited a high quality of animation, after having found previous success with Adventures of the Gummi Bears. They looked towards the world of Duckburg largely created by comic book artist Carl Barks for inspiration and came up with DuckTales. Developed by Jymn Magon, the series followed wealthy Scrooge McDuck (Alan Young) as he went on adventures with his nephews, Huey, Dewey and Louie (all Russi Taylor). Often, these adventures involved discovering some lost treasure to increase Scrooge’s fame and wealth, but other times it was protecting his businesses and interests from rival Flintheart Glomgold (Hal Smith), his #1 dime from evil witch Magica De Spell (June Foray), or his beloved money bin from the Beagle Boys (Frank Welker, Terry McGovern, Chuck McCann and Brian Cummings), and sometimes one of inventor Gyro Gearloose’s (Smith) inventions run amok. From top: Gyro, Launchpad, Duckworth, Mrs. Beakley, Huey, Dewey, Scrooge, Doofus, Louie and Webby. While largely inspired by Barks’ comics, DuckTales did have some differences. Scrooge wasn’t as much of a miser as he was thrifty, for example. Other changes saw Donald Duck (Tony Anselmo), who played a large part in Scrooge’s adventures, only present for the first episode to drop off his nephews; Glomgold, due to America’s tensions with South Africa, had his nationality changed to Scottish, amongst others. 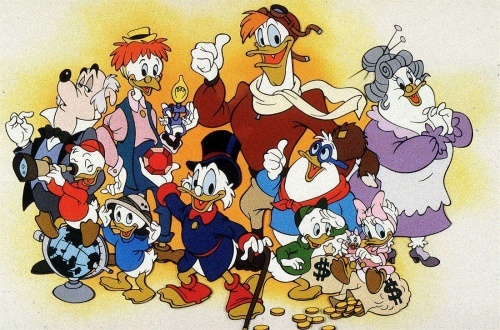 New characters included Scrooge’s butler Duckworth (McCann), housekeeper Bettina Beakley (Joan Gerber) and her granddaughter Webby (Taylor), accountant/superhero Fenton Crackshell aka Gizmoduck (Hamilton Camp), accident-prone pilot Launchpad McQuack (McGovern), and the boys’ friend Doofus Drake (Cummings), amongst others. 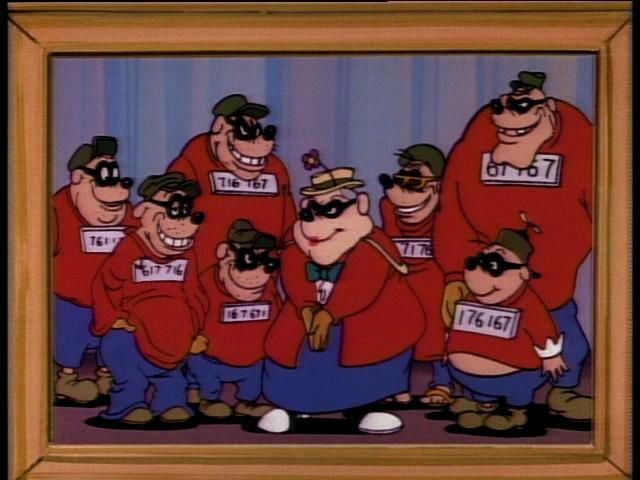 The family that steals together... Ma Beagle and her Beagle Boys. DuckTales premiered in syndication on September 18, 1987 with a 65-episode first season. A second season of 10 episodes and a third of 18 followed. In 1990, the series was given its own feature-length movie, Treasure of the Lost Lamp, which while successful, didn’t quite reach Disney’s expectations shelving any further entries. A 7-epsidoe fourth season, which featured three episodes held over from the previous, aired as part of the inaugural season of The Disney Afternoon syndicated programming block and remained there until 1992. After its conclusion, Launchpad was spun off into the show Darkwing Duck, and he and Scrooge appeared on Raw Toonage. DuckTales, meanwhile, entered into syndicated reruns, particularly on The Disney Channel, between 1995-99.